At BIAFF 2014 Alessandro Riconda won a Diamond award and Most Creative Use of Sound for Shame and Glasses . I wanted to make a short movie to use as "presentation" of myself, to show that I'm able to direct a movie even if I'm young. I needed it to be simple and cheap. Watching other shorts I understood the best way to do that is to make a silent movie. Without words you have to focus on the visual part of filmmaking, which is the real core of cinema, and someway you're forced to make something that really works on the screen. Further more, I've never been able to attend a film school, but I know the 5 minutes silent movie is a common exercise. I decided to build a visual conflict strictly based on a physical object and I thought glasses were a perfect item for this purpose. The rest of the story came by itself. The protagonist is a child because an adult would have been seen as a "strange" or someone a little stupid. The child helps the audience to identify and lets the story to be a little more universal. The production was tough I had just my own money and no friends with the required skills to make anything technically suitable for an international film festival. Fortunately I found a group of young people called Artwelve that helped me managing the set: they worked as line producers and put together a crew. It has been great because every one of us worked in his favourite role. For example the make-up artist was a girl whose dream is being able to work as make-up artist in the theatre and cinema fields. The money I had let me shoot for one day only. Not enough. We didn't finish. But the images were great and gave me the chance to realistically ask for money to finish the shooting. So the second shooting session took place 4 months later. The children had grown and the sun light was a different color, so it has been difficult to hide the differences between the two shooting sessions. But at last we came up with something that works. This is also the reason why the colors are so strong. We had to find a common look, even if it can be a little unrealistic. I'm very happy about the final result. It's a little different form what I wanted, of course. It has some problems, but people usually love it and the short managed to get into major festivals like TIFF Kids in Toronto. If you want to know more you can ask me anything you want at shameandglasses@live.it, I'll be happy to answer your questions and maybe get back to you with my future shorts. 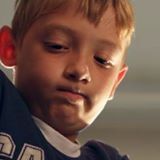 You can also find the short film on Facebook at www.facebook.com/shameandglasses. If you missed it at BIAFF you can find out how to watch it here.